This is a post from Nicole Koch, author of this blog and explorer of the human potential. You can book a session with me and learn more about upcoming courses. "The continual stream of new discovery, revelation and inspiration which arises at every moment is the manifestation of our clarity. We should learn to see everyday life as mandala – the luminous fringes of experience which radiate spontaneously from the empty nature of our being. The aspects of our mandala are the day-to-day objects of our life experience moving in the dance or play of the universe." A mandala is a sphere with a midpoint, and displays a field of elements, which are interconnected and express different facets of human life and the mind. The word mandala comes from the Sanskrit language and it signifies 'circle' or sometimes 'center'. 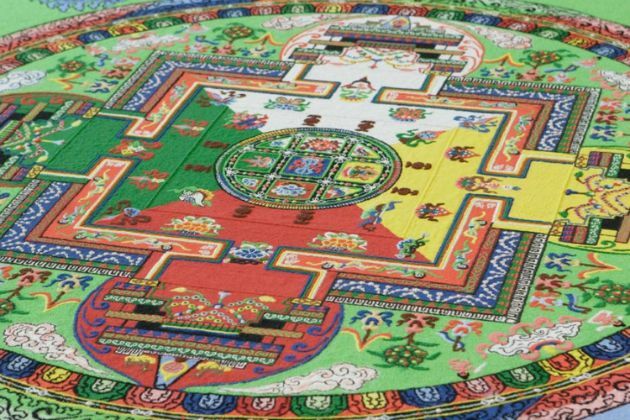 The mandala can be found in different traditions, and is particularly relevant in Tibetan Buddhist teachings which explore the mandala from the perspective of wisdom aspects, or energies, that are the fabric of our true intrinsic natural state. The mandala is sometimes considered a sacred map pointing us back to the center and wholeness and represents an alchemy of certain interconnected and related energetic patterns and potential doors into wisdom. A mandala is a reminder of unity, wholeness, and the journey back to the center. When we are the center of who we are, the periphery of the mandala changes and effects the experiential field in each moment. The mandala is the representation of the formless essence, and the infinite unending display of potential and possibility of phenomena manifesting in each moment. It can be helpful to see the whole universe as a mandala, and it is a helpful tool in recognizing that our moment-to-moment experience is the display of the mandala through feelings, sensations, emotions, thoughts, perceptions, and actions. The mandala is a helpful spiritual symbol, representation, tool and principle to open our eyes to the vast potential of human life and how we can transform our limitations into wisdom principles. The Mandala Project What is a Mandala? Mandala Colouring Meditation What is a Mandala? You can subscribe to the blog rss or via e-mail here.